A study of more than half a million blood samples has allowed scientists to pinpoint the risk factors for a rare type of leukaemia, enabling them to predict if someone will develop the disease eight years before symptoms appear and opening the door to preventative treatments. Acute myeloid leukaemia (AML) is a rare cancer usually detected at an advanced stage. "It usually comes out of the blue," said Dr. Liran Shlush of the Weizmann Institute of Science in Israel. "Most patients survive just a few weeks or months after diagnosis." Diagnosing the disease earlier so that patients do not become fatally ill has been the goal of leukaemia researchers for decades. However, studying AML is challenging: by the time patients are identified, they are too sick to participate in clinical trials. In 2014, Dr. Shlush and other scientists made a breakthrough by identifying cells where the disease begins. This paved the way for research on mutations (genetic changes) that are associated with a risk of developing AML. This was a significant step forward but presented new challenges. "It turned out that almost 30% of the general population carries these early leukaemia mutations," Dr. Shlush explained. "But AML is rare – this means that only a fraction of those with the mutations actually develop the disease. We needed a more specific way to predict who is at risk of developing AML." The team turned to the EPIC biobank – a collection of samples from more than 500,000 people in 10 European countries which was launched in the early 1990s. In addition to samples of blood and other cells, EPIC collected information on diet, lifestyle and medical history. Where these individuals were later diagnosed with cancer, this was recorded in the database so that researchers could go back and look for common factors that contribute to disease development. As part of the MAMLE project, Dr. Shlush's team studied EPIC blood samples to look for genetic differences in people who had gone on to develop AML and compare them with those who did not. This revealed around 260 genes commonly found in those who would later have the disease. Of those, 30 were found to be particularly important. However, the mere presence of these genetic changes did not always mean individuals would get AML later in life. The volume of cells with these mutations and the presence of specific mutations were what made the difference. "When we sequenced these genes for people who developed AML and compared to a group of people of the same age who didn't get the disease, we found that what mattered was how much of these mutated cells were present and which mutations a person had," said Dr. Shlush. "It's like risk factors for heart disease: the more bad cholesterol you have, the higher your chance of developing the disease." By testing for these mutations, researchers can predict the development of AML eight years before the patient notices any clinical symptoms. This new finding could be translated into a diagnostic tool. However, even at 99% accuracy, there would still be a high number of 'false positives' – people who are incorrectly told they are going to develop a devastating form of cancer in the years ahead. To narrow down the pool of high-risk patients, the team is now using information from electronic health records to single out individuals who have a combination of risk factors. This has helped them to identify people with specific genetic and other characteristics who doctors can say with almost 100% certainty will develop AML. The Israel-based scientists are designing a clinical trial to test a drug that they hope will slow – or prevent – the disease from advancing. Several existing therapies could be trialled, beginning with an antibiotic that already has approval from drug regulators for treating other conditions. Because it has been tested previously for safety, scientists can skip straight to large human trials to examine the drug's effectiveness in patients at high risk of AML. "We know this drug is very safe, we know a lot about dosing, and that it can be taken orally," Dr. Shlush said. "We think that it could shrink the precancer stages and make the development of the disease much slower." As AML is typically diagnosed in older people, slowing disease progression could mean that it never actually occurs in the patients' lifetime. The academic researchers have secured the cooperation of the company that makes the drug and are working through logistical challenges of testing a medication in healthy people, many of whom have never heard of AML. "We will have to screen thousands of people to find eligible participants," Dr. Shlush explained. "That's the main obstacle and it presents ethical issues. Clinical trials are normally conducted in people who are attending a hospital because they are sick. We will need to contact at-risk individuals who are currently healthy and unaware of their risk of leukaemia." Once this is overcome, recruitment for the trial will begin. Building the infrastructure for the first study will be labour-intensive but the same population could be used to try several existing and new drugs. "By tracking the type and volume of mutations in these individuals during treatment, we can see whether their risk grows, stabilises or disappears," he said. "We hope that this will help us to find something that inhibits disease development for a cancer where there is a major need." 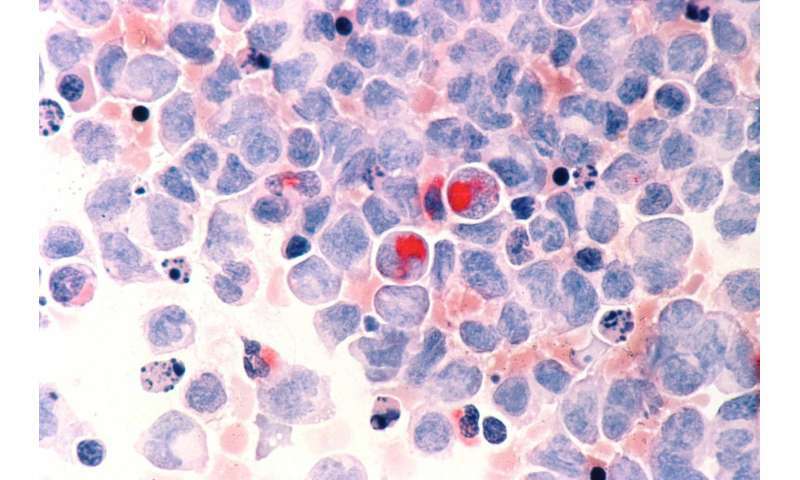 Acute myeloid leukaemia is a disease of immature blood cells. Instead of developing into mature blood cells with finite lifespans, cells with compromised DNA or compromised regulation of DNA continue to divide. Eventually, these diseased cells take over and cause devastating effects on the body. Understanding how AML occurs is difficult because the disease develops silently for many years before patients suddenly have severe symptoms. Researchers at Lund University in Sweden are using an alternative to studying human patients: they have developed a mouse model in which they can induce the disease. Professor David Bryder, who coordinates a project called LEUKEMIABARRIER, says AML develops over a long period due to the cumulative effect of several changes in DNA. "It's not a case of someone suffering a genetic mutation and coming down with the disease overnight," he explained. "There may be a first event – such as DNA damage – and then, much later, a second event, followed later by a third, and so on. "Eventually this combination of changes adds up to an acute illness." The mouse model used at Lund University offers insights into how the disease develops by inducing genetic changes in mice and studying the events. This allows scientists to study how ordinary blood cells turn into leukaemia cells, and why the body fails to keep them in check as they divide uncontrollably. "Using our AML model, we have found, quite surprisingly, that blood stem cells – the most immature cells in the blood system – are not where leukaemia begins," he said. "That was quite unexpected because those cells were seen as the most likely source of disease." Instead, the Lund team identified a whole range of cells at different stages of normal development, that were capable of giving rise to leukaemia. Now they can use this knowledge to explore possible new ways to diagnose and treat AML. If it works in mice, it could eventually be tested in humans. "There is a big difference between mice and men but many of the same principles apply," says Prof. Bryder. Could immune system spark new therapies for hard-to-treat blood cancer?